Samsung just announced pre-order dates for two of its newest tablets and one of its latest Galaxy Player devices. The Galaxy Tab 2 7.0 is now available for pre-order for $249.99 and will be in retail stores on April 22nd. 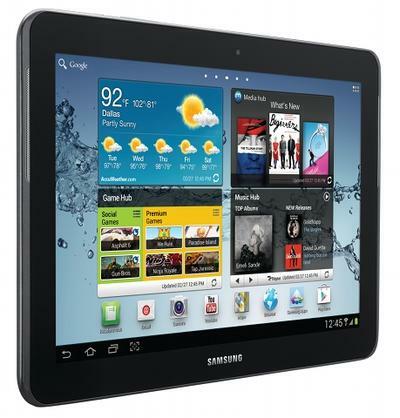 The Galaxy Tab 10.1 ($399.99) and the Galaxy Player 4.2 ($199.99) will be available for pre-order on May 4th and will be available in stores on May 13th. The Galaxy Tab 2 7.0, which we recently reviewed, runs Android 4.0 Ice Cream Sandwich and is equipped with a 1GHz dual-core processor, 8GB of storage, a microSD card slot for adding more storage, Wi-Fi 802.11b/g/n, Bluetooth 3.0 and more. The Galaxy Tab 2 10.1 basically offers the same specs but has a slightly sharper 1280 x 800-pixel display and 16GB of storage. Finally, the Galaxy Player 4.2 runs Android 2.3 Gingerbread and has 8GB of storage and a 2-megapixel camera. RIDGEFIELD PARK, N.J., April 11, 2012 – Samsung Electronics America Inc., a market leader and award-winning innovator in consumer electronics, today unveils the latest additions to the popular Samsung Galaxy line of handheld and portable devices. The two new Galaxy Tab 2TM products and two new Galaxy Players TMcontinue to showcase Samsung's commitment to providing users with choice, flexibility and connectivity to the full Samsung ecosystem of products, apps and services. The Galaxy Tab 2 Series, available in both 10.1" and 7.0" screen sizes, are powerful dual-core tablets running the latest version of Android – Ice Cream Sandwich. The devices feature an integrated IR blaster for universal remote capabilities, as well as an easily accessible memory card slot for convenient loading of multimedia files in a range of supported file formats. The new tablets offer endless content access in a sleek design that can maximize the home entertainment experience. The Smart Remote App and built-in IR Blaster turns the Tab 2 into a universal smart remote, helping users easily find their favorite shows. Users can choose from more than 450,000 apps, access favorite movies and TV shows from Google Play or Media Hub, and surf millions of web pages with Adobe® Flash™ support. In addition, the Galaxy Tab 2 products are fully Google certified for complete access to Google Play (formerly Android Marketplace) and competitively priced at $399.99 and $249.99, respectively – so consumers no longer need to compromise when selecting a tablet. "These new Galaxy Tab 2 and Galaxy Player devices deliver what consumers have come to expect from all Samsung products – exceptional design, impressive connectivity options and a selection of choices for each type of person and user scenario," said Tim Baxter, President, Samsung Electronics America. "A one size fits all solution is just not sufficient." With the two new Galaxy Players, available in 4.2 inch WVGA screen or 3.6 inch HVGA screen variants, gaming, videos and music are more fun than ever. Easily connect to Wi-Fi hotspots anywhere to get instant access to the latest content. Users also can play their own video and music in a variety of formats, connect to other devices using USB 2.0 or Bluetooth 3.0 connectivity, or simply load the device via a micro SD card. Because the device runs on Android™ 2.3, Gingerbread, a world of apps is a touch away. Plus, dual-stereo speakers (on the Galaxy Player 4.2) deliver an incredible music, video or gaming experience – anywhere.